Sometimes when I preach I think of things and find my mind taking a small detour:) I would love to say that every time this happens it is a good thing but I cannot tell I lie! Last weekend I was discussing something to the effect that Christ is an obstacle remover and a stain remover. And then it hit...my mind began to see all of those products in my laundry room that take stains away. 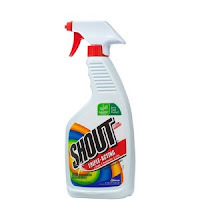 I saw the bottle of SHOUT! When I face a terrible stain on my clothes I have to SHOUT it out! Aren't you glad they didn't call that stuff "whisper?" Who ever heard of the "Stain Whisperer?" After that I simply told all of the folks about how I have surrounded myself with positive things. My dish washing detergent is JOY! My laundry soap: CHEER! And some of the folks were feeling the conviction of the Holy Spirit because right in that cupboard of their laundry room was a dryer sheet called "Downy!" I'm not going down, I'm going up...so my dryer sheets are called GAIN! We all had a great laugh about all of this and now I am looking at all of the stuff that surrounds me. I just seem to feel better when I am covered by positive things. You will too!